There’s been a heck of a lot of sock talk around here lately. So, I have some more! OR, you could guild the lily and go one more step and block the suckers. Your socks will fit just fine without blocking them, so if I’m just making socks for myself, I won’t do it. But, if I’m making the socks as a gift, I’ll block them. Blocking just makes the toes and heels lay nicely and fixes all those little weirdnesses that happen during knitting. A clean bowl (or a clean sink) filled with bathwater-warm water. Drop your socks into the bowl of water, and let them soak for about 20 minutes. They need to be completely saturated. 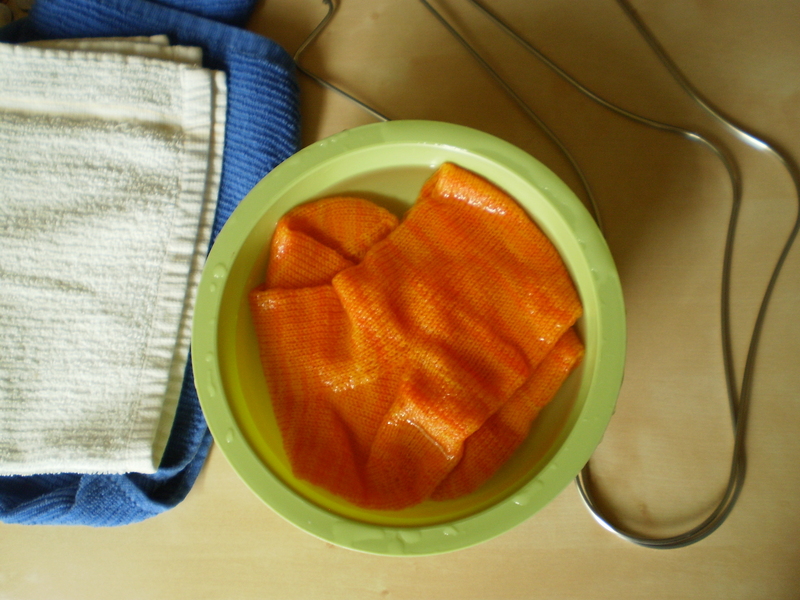 Don’t scrub or squeeze them or anything, just lay them nicely in the bowl of water. If you mess with them too much, they’ll start to felt, which is not ideal. You can poke them a bit until they go underwater, if you feel it’s necessary. After your socks are thoroughly saturated, take them out of the bowl and squeeze them gently to get rid of a good portion of the water. They should still be wet, but not drippy. Now you have two options. The easiest way to block socks is to use sock blockers (duh). 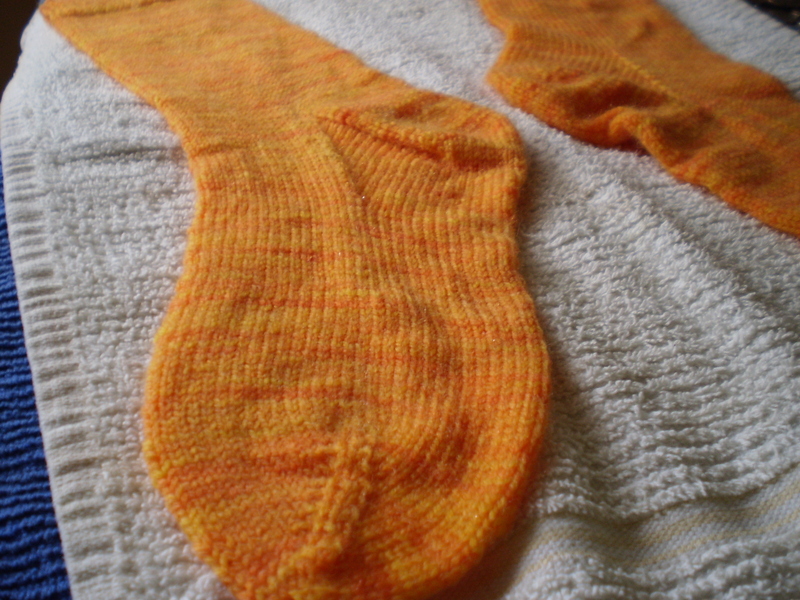 Sock blockers are sock-shaped forms that you put your wet socks on to dry after you’re done knitting them. You can find them at your local knitting store, or you can buy them here. 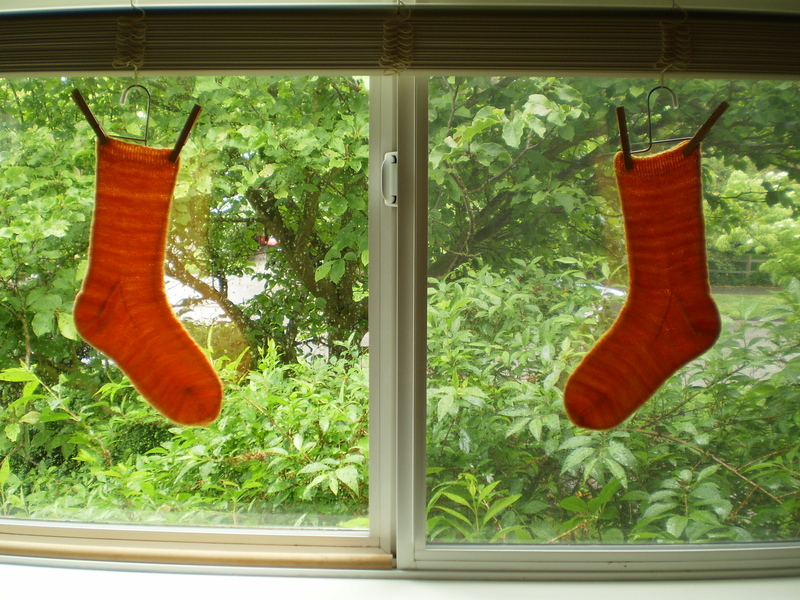 Basically, you put the damp socks on the sock blockers, and let them hang to dry. (My socks are a skotch too big for my blockers, so I use clothespins to keep them on the blockers.) If you don’t own blockers, not to worry. 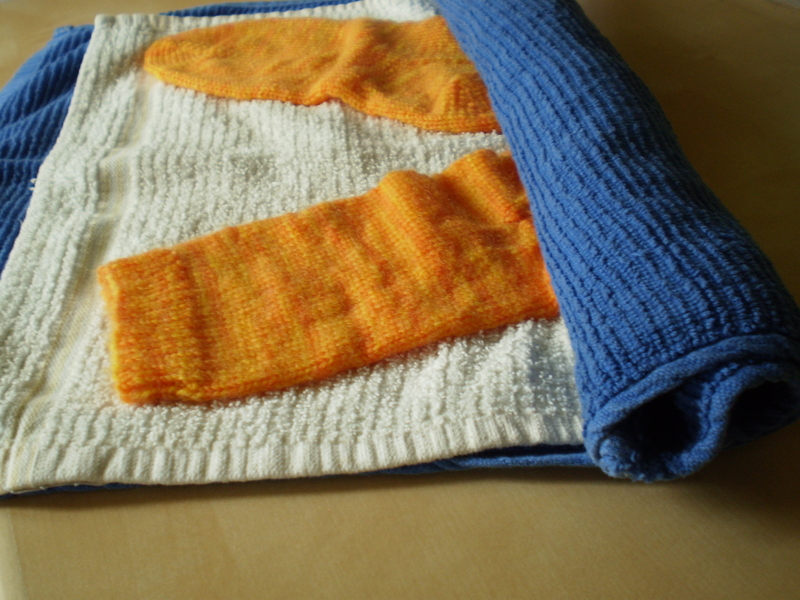 You can get out another clean, dry towel and lay your socks out nicely on the towel and leave them out to dry. Now, your beautiful socks are completely, totally and 100% DONE! How exciting. And, just in time for summer (because nothing says summer, like wool socks). This entry was posted in Knitalong and tagged blocking, finishing, how-to, knitalong, recipe, sock, sock blockers, top-down on May 31, 2013 by onemilljellybeans. Don’t fall pray to Second Sock Syndrome. Knit your second sock, and make sure your feet get the love that they truly deserve. I made sure to follow the exact same pattern that I used to make my first sock, so that they match perfectly. 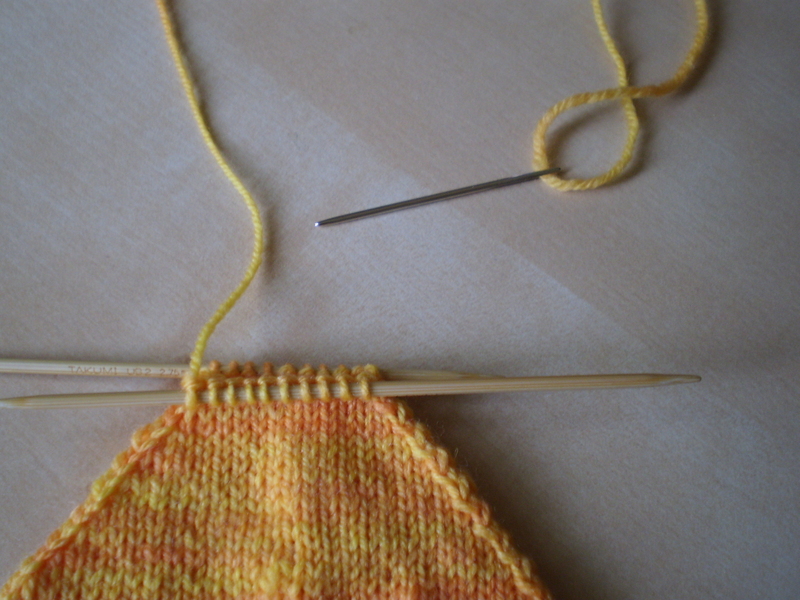 Count your rows in the leg and instep, so that one sock doesn’t end up longer or shorter than the other one. Also, in case you were wondering, I didn’t make a whole sock in two days. I’m fast, but not that fast. This entry was posted in FYI and tagged finishing, how-to, kitchener stitch, knitalong, recipe, second sock syndrome, sock, top-down on May 29, 2013 by onemilljellybeans. We’re in the final stretch! All we have to do today is to close up the toe and weave in the ends. Then you’ll have a beautiful new sock! 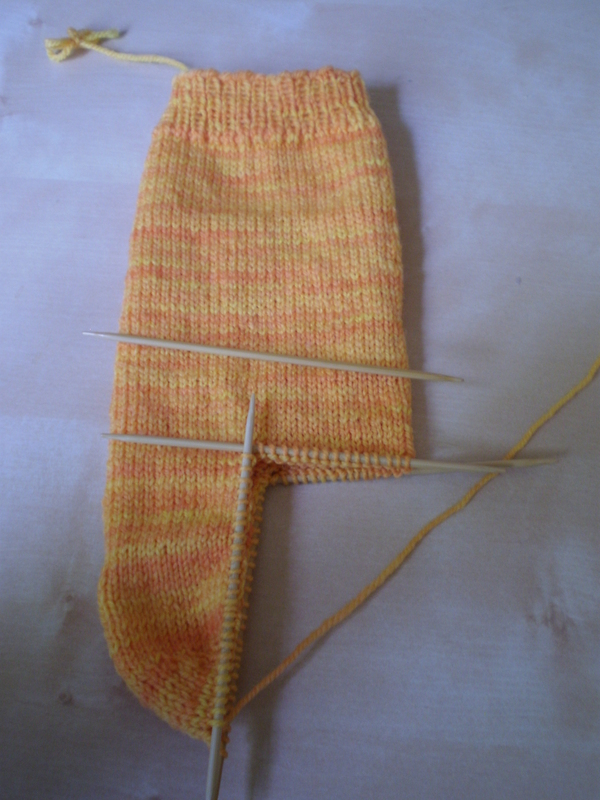 OK, when we left off on Friday, you had finished with needle 4 (your active yarn was at the bottom of the sole). 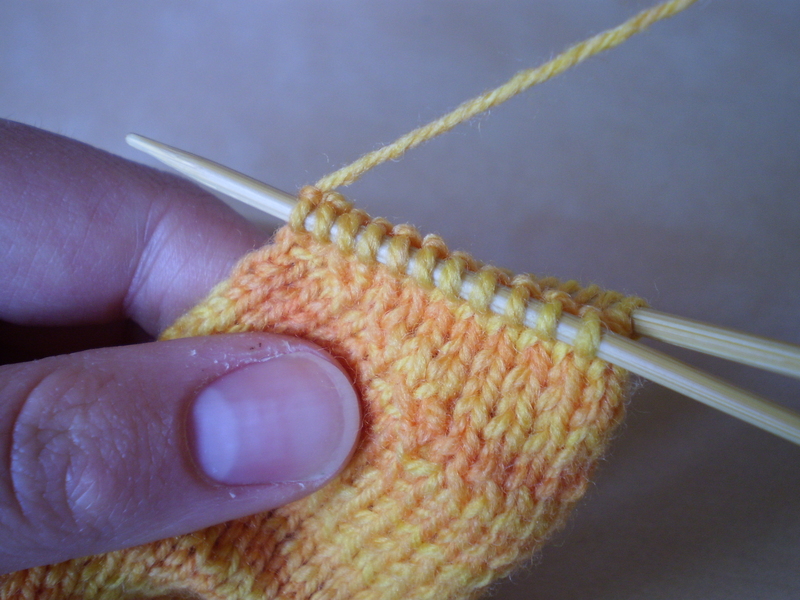 Knit needle 1, so that your active yarn is coming from the side of the foot (by where your big toe/pinky toe would sit if you put on the sock). You’re now officially done with knitting the sock! Yay! No more knitting. Just grafting the toe closed. Now, using the Kitchener Stitch, graft these stitches together. This is a great video tutorial, if you haven’t done it before. See how the knitting flows nicely from the top of the foot to the bottom of the foot? Very pretty. Now, all that’s left is to weave in your ends, and your sock is done! Congratulations! You’ve now completed your first sock! This entry was posted in Knitalong and tagged finishing, grafting, how-to, kitchener stitch, knitalong, recipe, sock, toe, top-down, tutorial on May 27, 2013 by onemilljellybeans. So, there are a bunch of ways to do toes, just like there are a bunch of ways to do heels. You’re welcome to use whatever method you like, but here’s what I do. It’s easy, and gives me a nice result. Row 1: Needle 1: knit to 2 stitches before the end of the needle. K2tog (right leaning decrease). 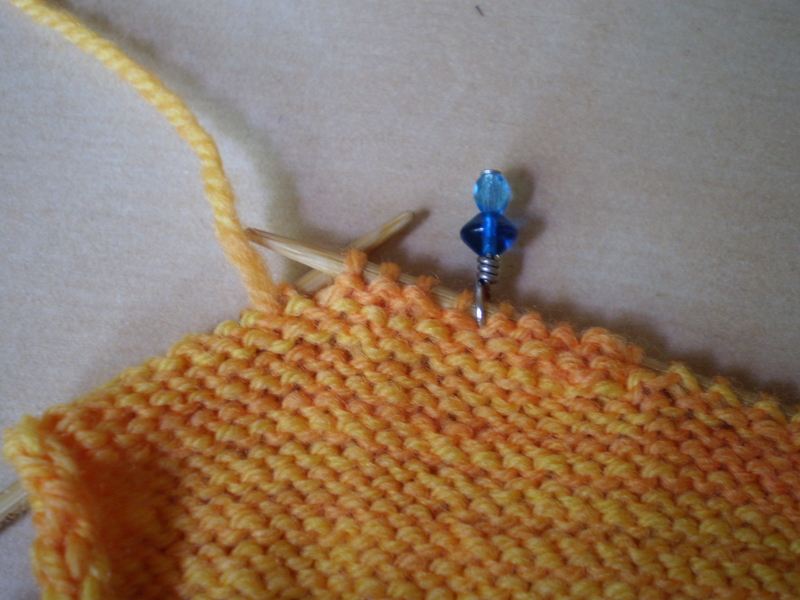 Needle 2: ssk (left leaning decrease), then knit to the end of the needle. 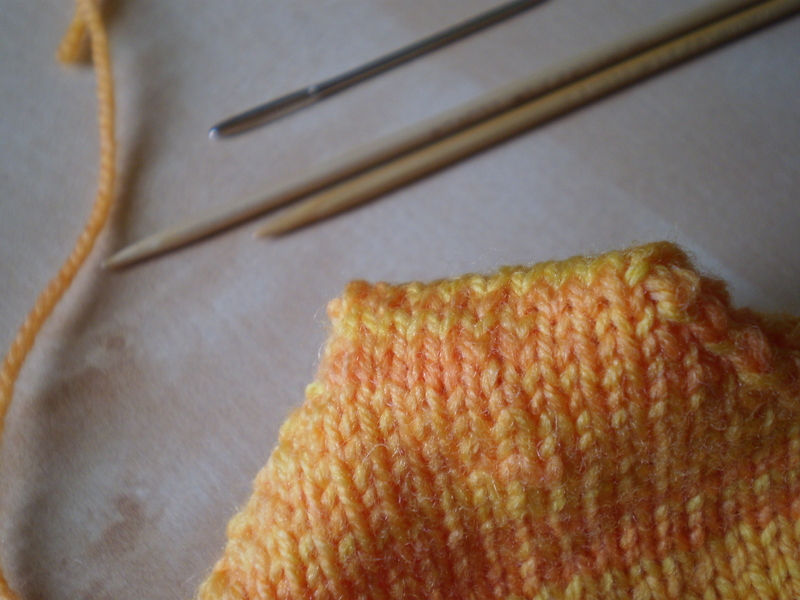 Needle 3: knit to 2 stitches before the end, k2tog. 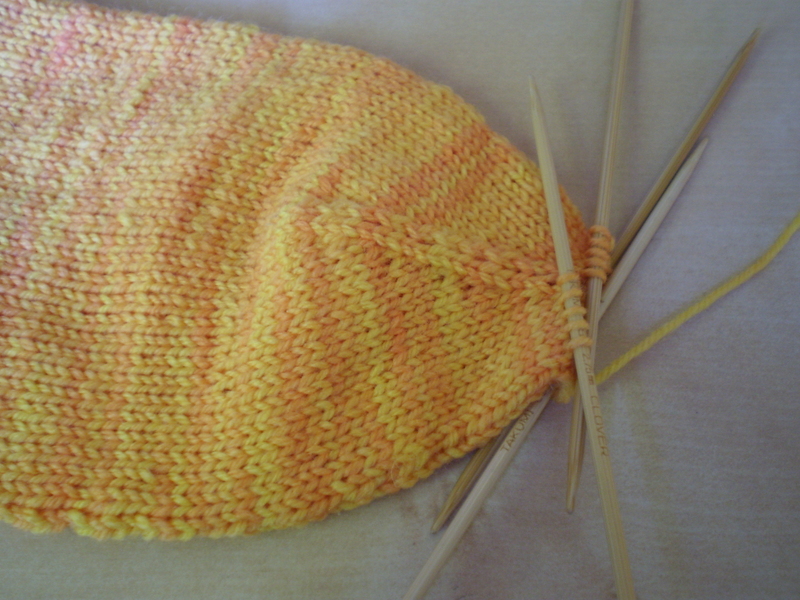 Needle 4: ssk, knit to end of needle. 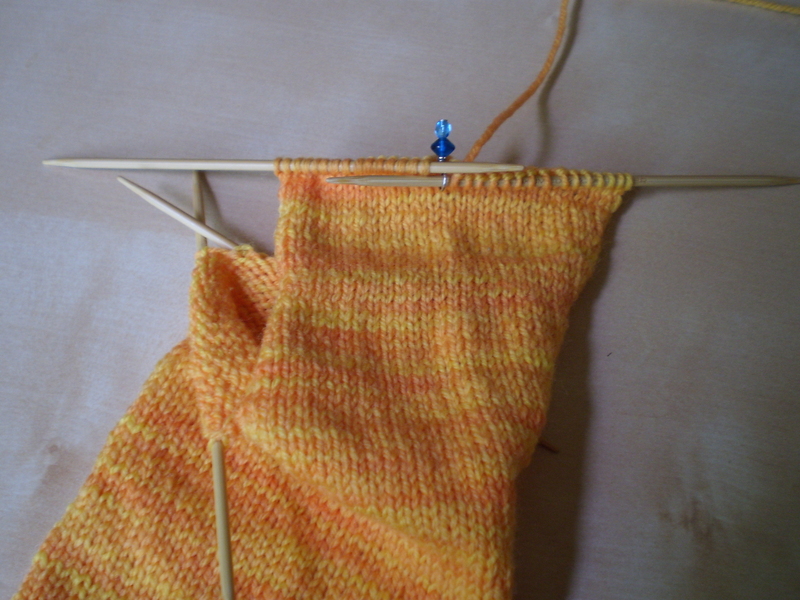 Row 2: Knit evenly (no decreases). Repeat these two rows until you only have 5 stitches left on each needle, finishing with Row 1. (Note: if you’re using this recipe to make tiny kids’ socks or doll socks, you’ll want to keep decreasing until there are 2 or 3 stitches left on each needle.) You should have 20 stitches total. Here’s what your toe should look like. See how the decreases end up lining up nicely? Have a fantastic weekend! We’ll finish the sock on Monday!! 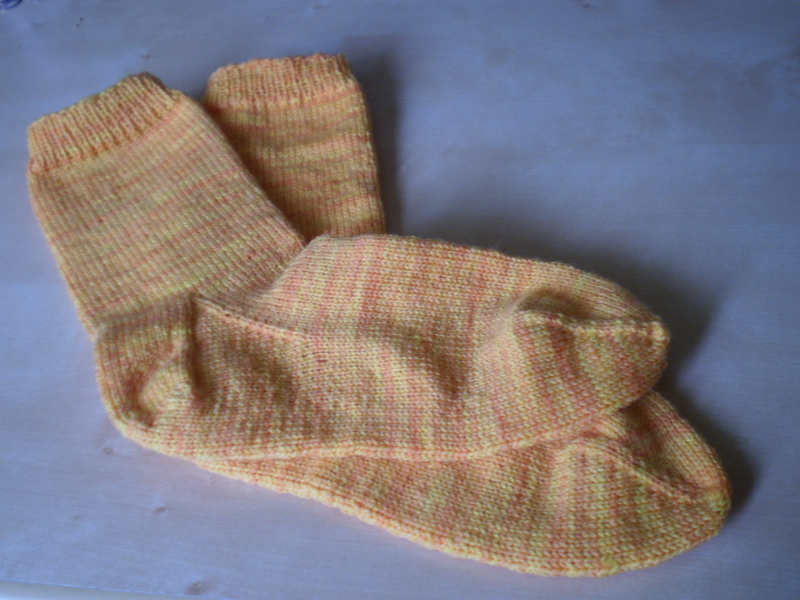 This entry was posted in Knitalong and tagged how-to, k2tog, knit two together, knitalong, recipe, slip slip knit, sock, ssk, toe, top-down, tutorial on May 24, 2013 by onemilljellybeans. So, I’m kind of running out of funny ideas for sock post titles. Also, I now realize that this has taken WAAAY more than a week. So perhaps I should have called it Sock Month. But, I suppose it’s too late for all that. Anyway. Today’s step is stupid easy. We’re going to make this “instep” of the sock. The folks that write books about knitting call this the instep. But I think it should more accurately be called the “foot-part.” Basically, it’s the part of the sock between the gusset and the toe decreases. And it’s really simple to do. You knit. That’s all. No fancy decreases or increases, no picking up stitches, no dropping stitches, no short rows, no ribbing (unless you really want to for decorative reasons) or anything else. 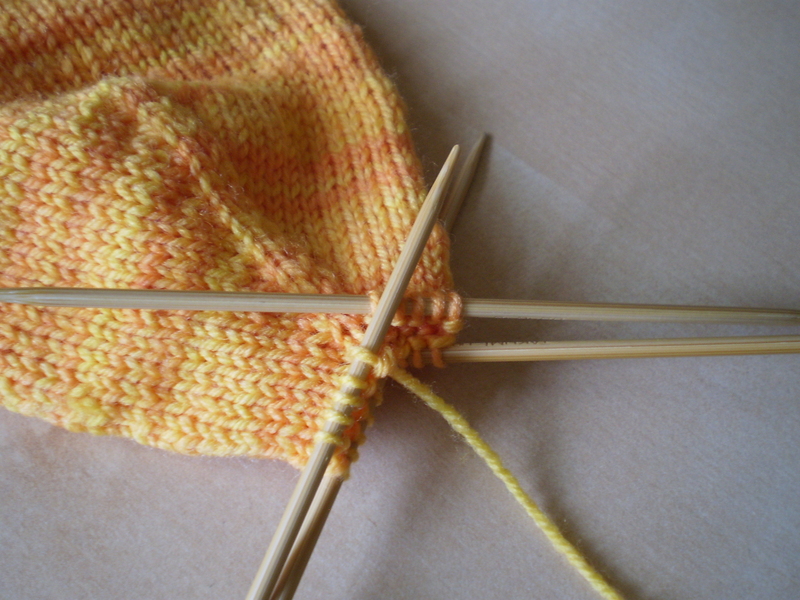 Just knit a tube until your sock is 1 1/2 inches shorter than you want your finished sock to be. How long do you want your sock to be? As long as your foot (see, I told you this step was easy). Measure your foot from the back of your heel to the tip of your big toe (or whatever toe is longest). Subtract 1 1/2 inches. 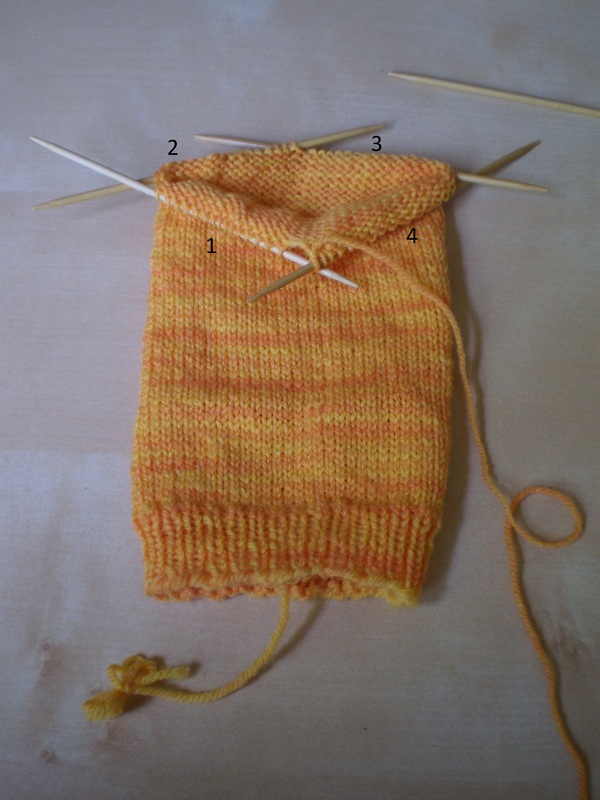 Knit your sock instep until the sock measures that length from the back of the heel to the needles. For example, my bare foot is 10 1/2 inches long. So I knit my instep until the sock measured 9 inches long from needles to the back of the heel when laid out flat. In my opinion, it’s better to err on the side of making your sock a smidge too big. No one wants socks that are too small. See? I realize I forgot to include a ruler in this photo, so you’ll have to take my word on the length of my sock. If you don’t have a ruler hanging around, just keep trying on your sock until only 1 1/2 inches of toe poke out the end. If you’re knitting socks for someone whose feet you don’t have access to, this website has some good sizing charts. And, because I feel like this is a rather short post today, and because I’m getting a little sock-crazy, here’s a weird video I found on the internet today. You’re welcome. 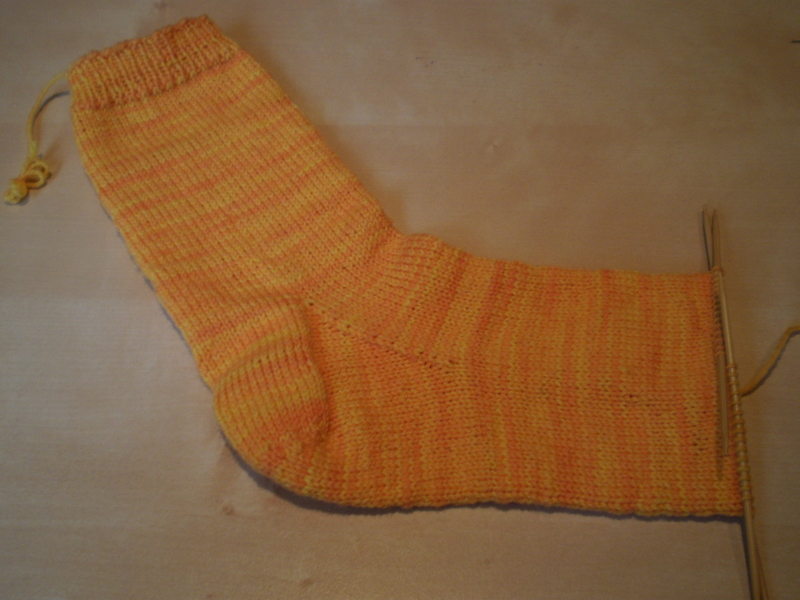 This entry was posted in Knitalong and tagged how-to, instep, knitalong, recipe, sock, top-down, tutorial on May 22, 2013 by onemilljellybeans. Today we’re going to do the sock gusset. I don’t know why, but I always feel like “gusset” is a vaguely dirty word. I don’t know why though. I guess I’m just being weird. 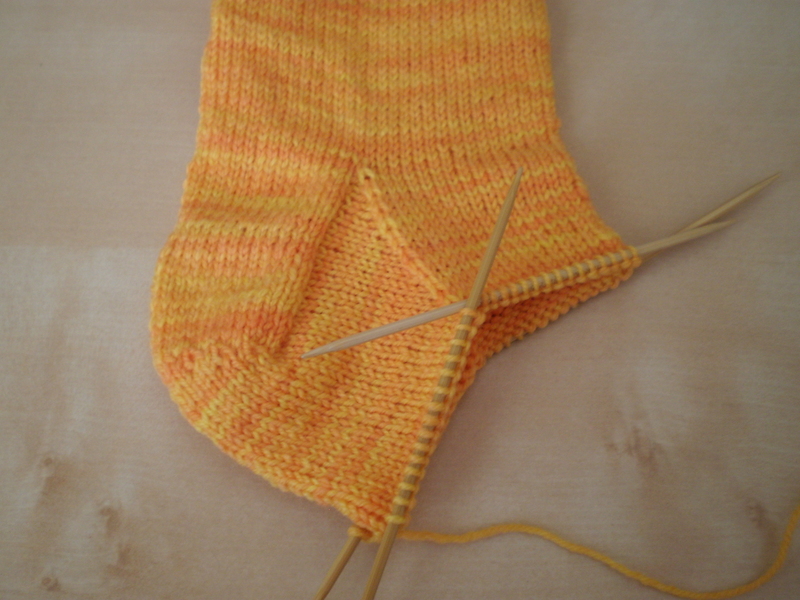 Anyway, the sock gusset is the part of the foot right next to the heel. 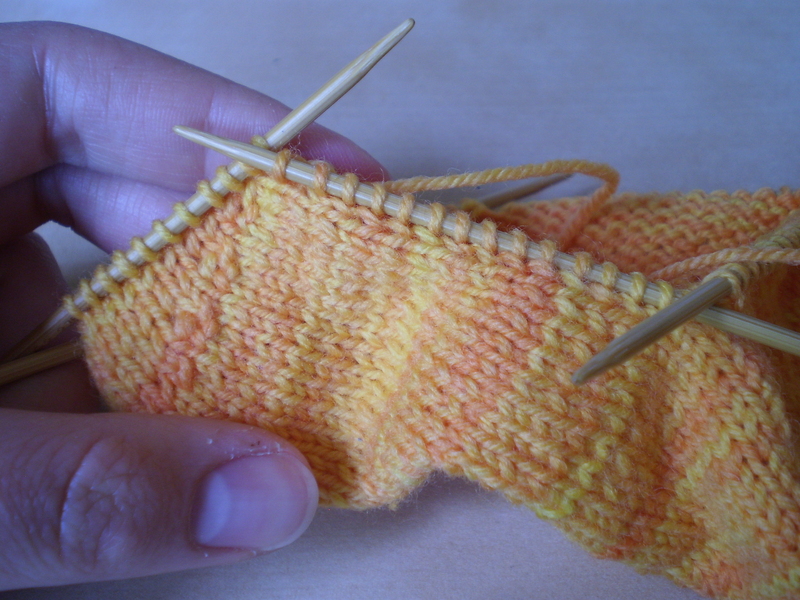 To make the gusset, you’ll decrease two stitches every other row, until you’re back down to your Sock Number of stitches. It’s super easy, and kind of fun watching your little decreases line up nicely. So, needles 1 and 4 are the bottom of the foot, and needles 2 and 3 are the top of the foot. Row 1: Knit to two stitches before the end of needle 1. Knit these two stitches together (k2tog). 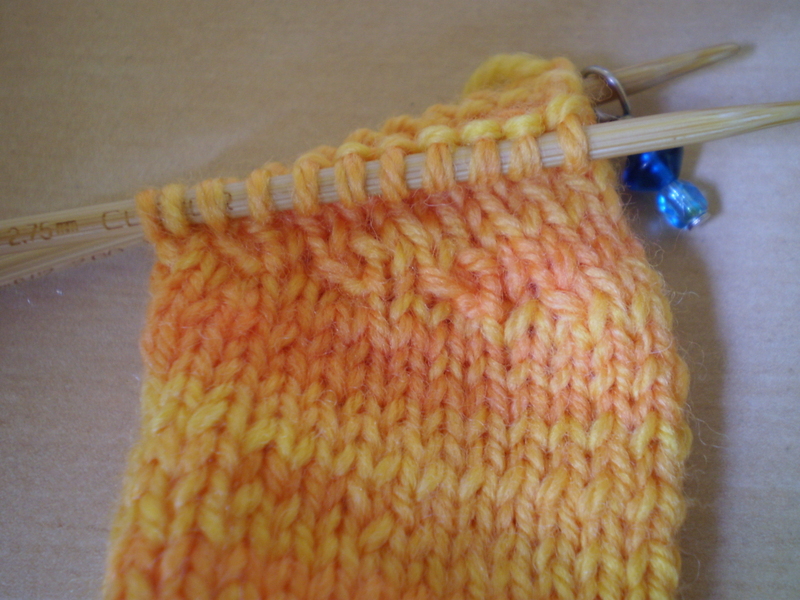 Knit needles 2 and 3 with no decreases. 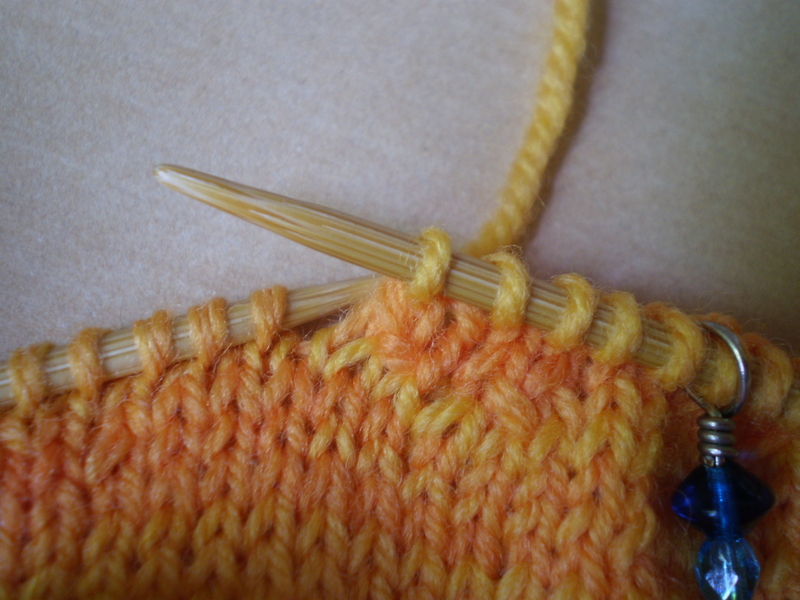 On needle 4, slip, slip knit (ssk) to work the first two stitches together, then knit to the end of the row. You will have decreased 2 stitches on this row. If you need a reminder about the difference between k2tog and ssk, try this video. 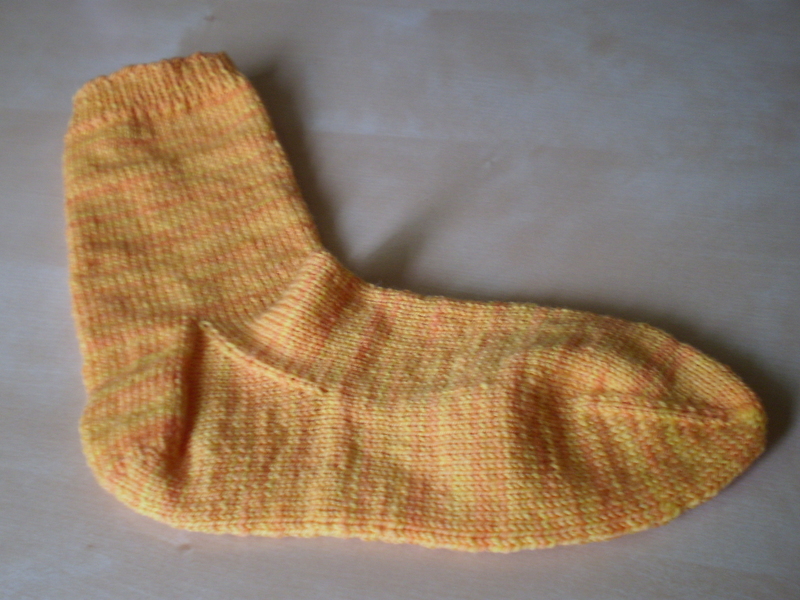 Row 2: Knit even (no decreases). Repeat Rows 1 and 2 until all of your needles have the same number of stitches. See how the decreases line up nicely, and make cool triangle-y shapes on both sides of your sock? That’s your gusset. This entry was posted in Knitalong and tagged gussett, how-to, k2tog, knit 2 together, knitalong, recipe, slip slip knit, sock, ssk, top-down, tutorial on May 20, 2013 by onemilljellybeans. Anyway, today we’re going to do the set-up row for the foot part of the sock. It’s a little fiddly, but not too difficult. Much like the rest of making socks. I’ve numbered the needles again, for your reference. 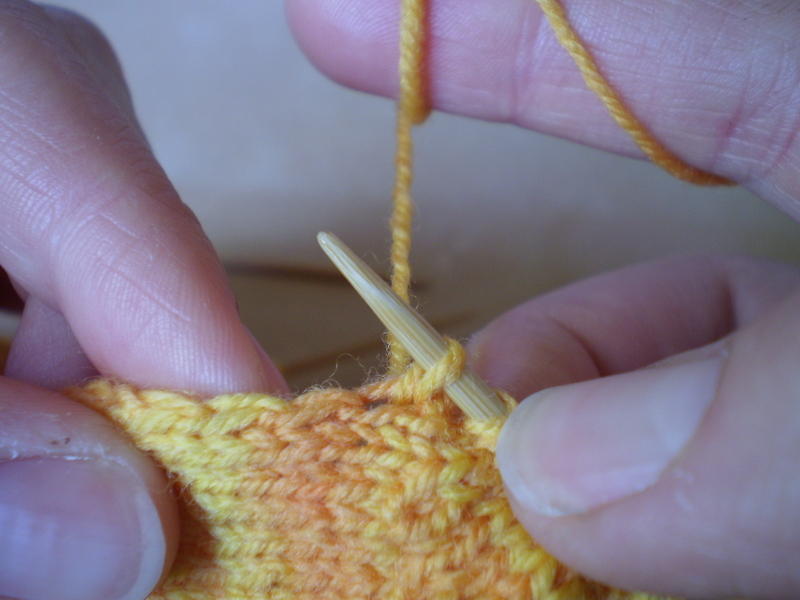 Picking up stitches is just like knitting, only you don’t need live stitches to start with. Insert your needle where you want the stitch to go. 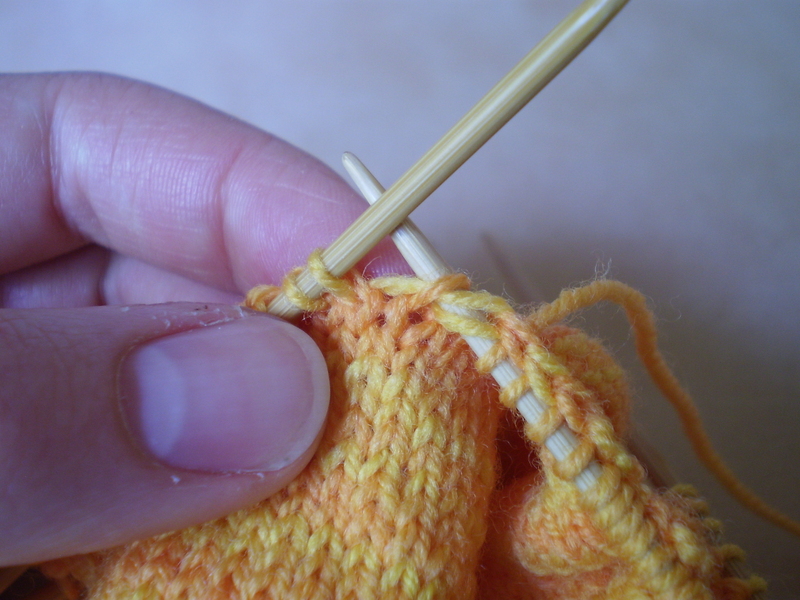 Wrap the yarn around your needle, just like you do when you knit. And pull the stitch through. If you haven’t done tried picking up stitches, this is a pretty good video. When you get to the last picked-up stitch, pick up both the usual slipped stitch as well as the stitch below, then knit it as normal. This will prevent your sock from having a little hole on the side. If you skip this step, it’s not a big deal, but it makes a nicer finished product. 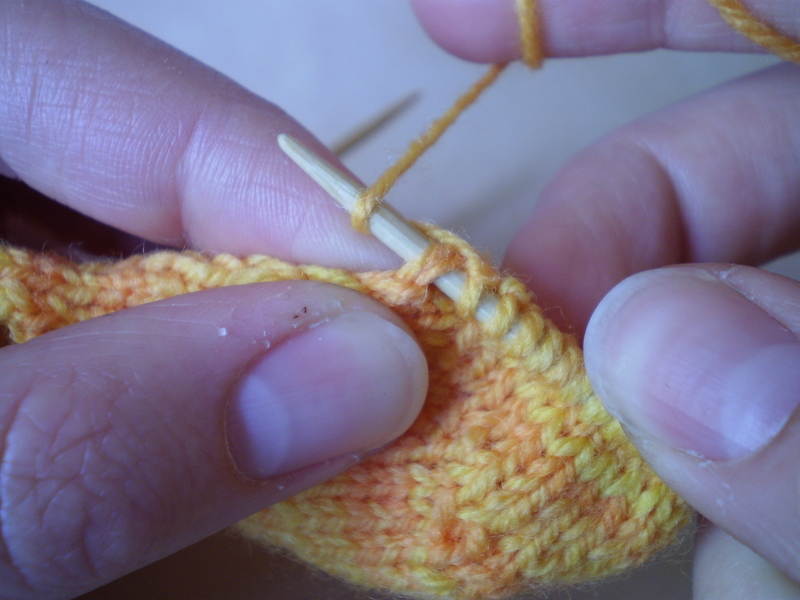 Then, using your fifth needle, and continuing in the same direction around your sock, pick up and knit the same number of stitches up the other side of the heel flap. If you want to do the fancy-pants no-holes pick-up, like on needle 1, do it at the beginning of this needle. 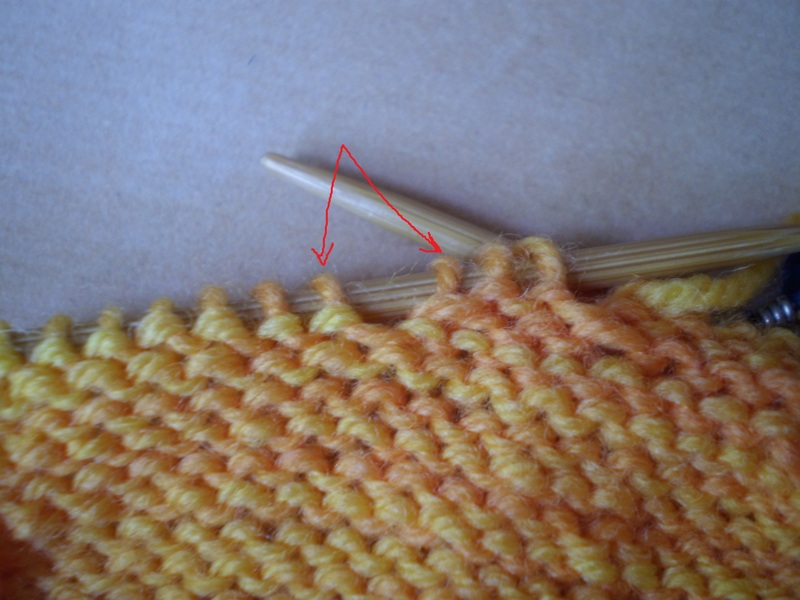 Then, using the same needle, knit the stitches from needle 4 as normal. Needles 1 and 4: A bunch of stitches, but both should have the same number of stitches. 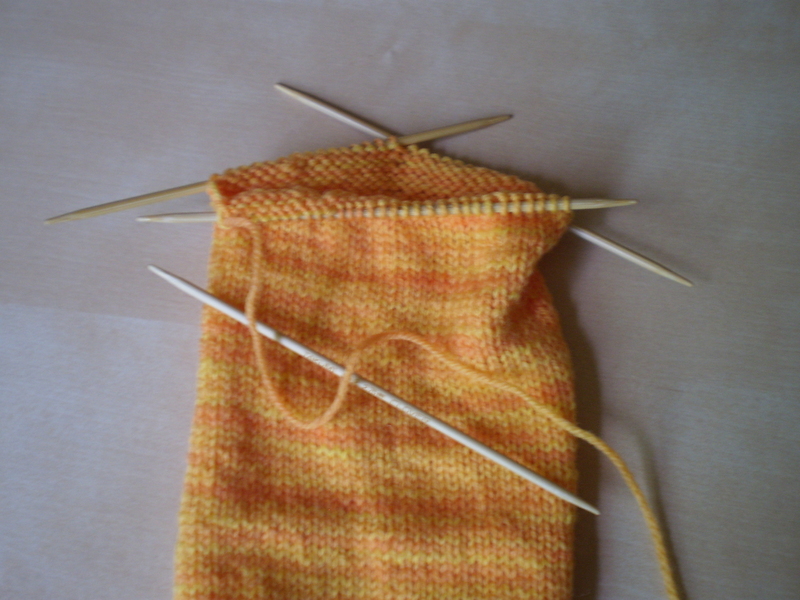 Needles 2 and 3: Both of these should have stitches equal to a quarter of your Sock Number. *Emergency Cakes-Cakes that one has to make at the last minute when your friend begs you to bring desserts for a fund raiser that is happening this evening. Stressful, but tasty. This entry was posted in Knitalong and tagged heel, how-to, knitalong, pick up and knit, recipe, sock, top-down, tutorial on May 17, 2013 by onemilljellybeans. So, I don’t know about you, but my heel isn’t square-shaped, so we probably shouldn’t make our socks square-shaped, too. To do this we’re going to “Turn the Heel.” I got completely confused the first time I did this, so I’m going to do my best to help you through. We can do it together! Solidarity! Anyway, “turning the heel” involves making short rows across the heel flap and throwing in some decreases as we go, to make the heel… well… heel-shaped. The goal is to end up with a little round, cup-shaped heel. “Short rows” are rows that are knit only partway across. This lets you start building up 3-D structures, instead of just flat pieces. Some people use short rows for things like puffy sleeves or fitted bust lines on sweaters, or faces on teddy bears etc. OK, so get out your sock and follow along. You’ll be starting from the marker at the back of the sock. Turn the work and Purl to the marker. Purl 2, P2tog, Purl 1, wrap and turn. Turn the work back to the knit side. See where there is a gap from where you wrap and turned? 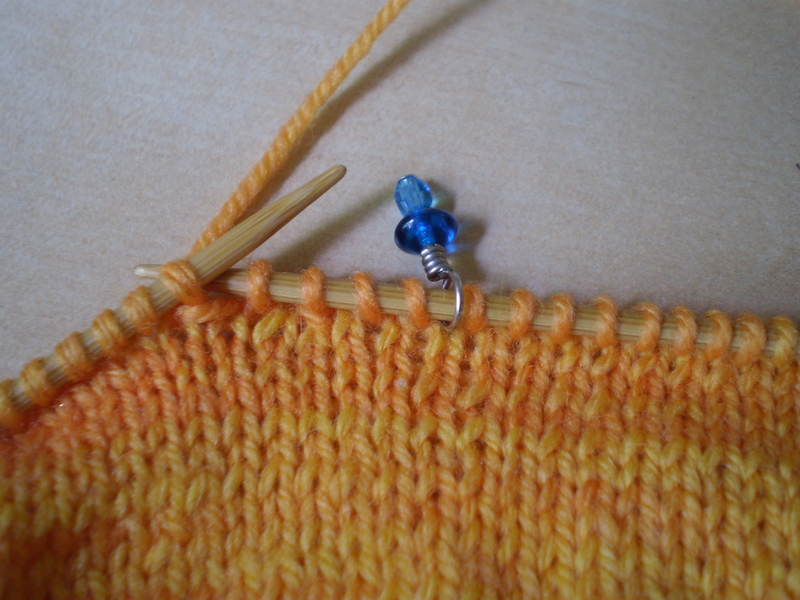 Knit until one stitch before the gap. 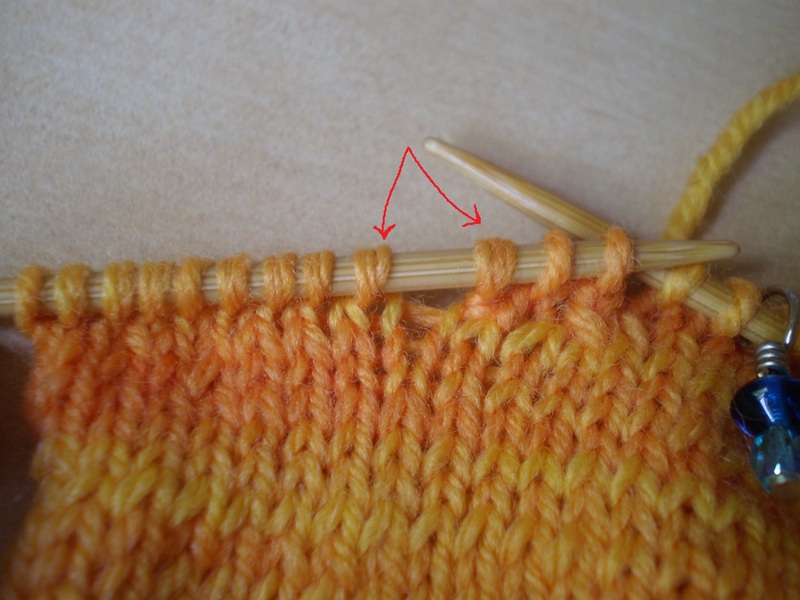 Knit the two stitches on either side of the gap together. Knit 1, wrap and turn. Then, do the same thing on the purl side. Purl until one stitch before the gap and purl the two stitches on either side together. Purl 1, wrap and turn. You’ll work more and more stitches each row that you work. On Friday we’ll pick up stitches to get set up for the gusset. 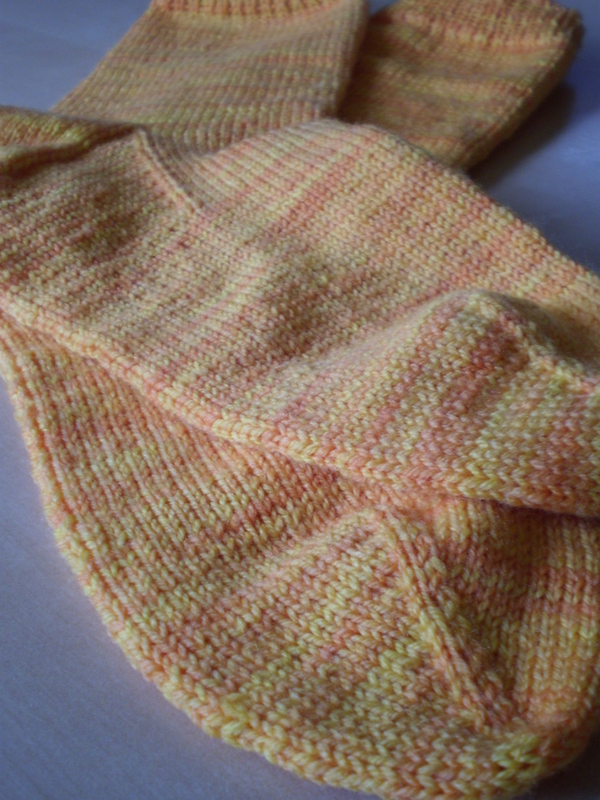 This entry was posted in Knitalong and tagged heel, how-to, knitalong, Leg, recipe, short rows, sock, top-down, turn heel, tutorial, w&t, wrap and turn on May 15, 2013 by onemilljellybeans. How’s your sock looking? Pretty tubular? Now, you could just make a big tube and close it up at one end and say “Hey, It’s a sock!” But I think foot-shaped socks are much better than tube-shaped socks. They are more comfortable and more interesting to knit. Needles 1 and 4 are the back of the leg/heel/sole of the foot. Needles 2 and 3 are the shin and the top of the foot. 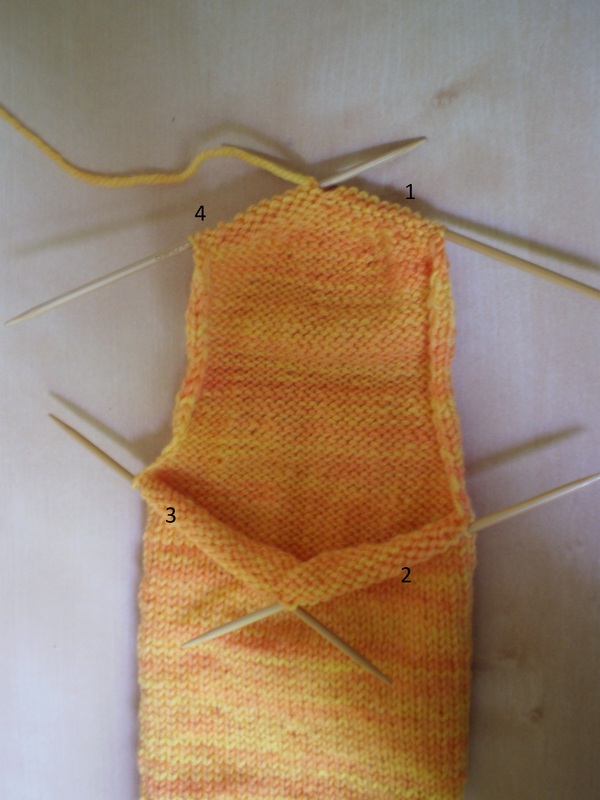 The end of the row is between needles 1 and 4. Work the heel flap back and forth, not in the round. 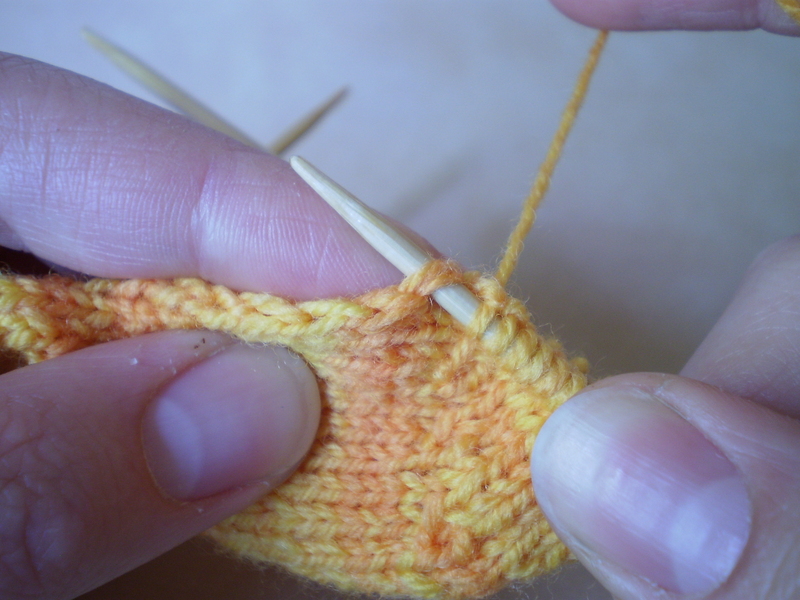 Do not knit any of the stitches on needles 2 or 3. Since we’re doing stockinet stitch back and forth, make sure to knit one row and purl one row. Every time you start a new row, slip the first stitch. This makes a nice edge that will make it easier for us to pick up stitches later on. Your heel flap is done when you’ve worked rows equal to half your Sock Number. (My sock number is 60, so I’ll work 30 rows for my heel flap). Wednesday, we’ll turn the heel! 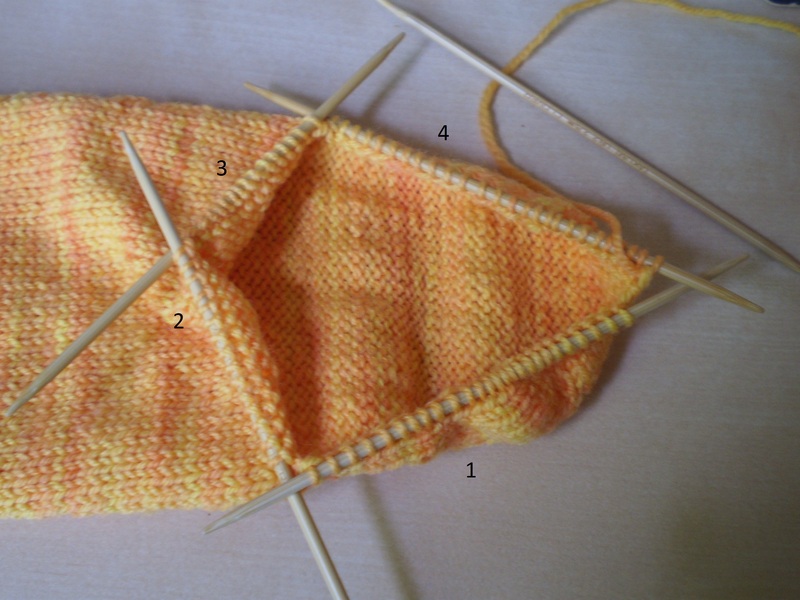 This entry was posted in Knitalong and tagged heel, heel flap, how-to, knitalong, Leg, recipe, sock, top-down, turn heel, tutorial on May 13, 2013 by onemilljellybeans. I am. And apparently overexcited. Or possibly over-caffeinated. Which is often the same thing. Without further ado, let’s get started. So, these are “top-down” socks, meaning that we cast on at the cuff, and work down to the toe. Some patterns are worked “toe-up,” but it’s really just a personal preference if you like top-down socks or toe-up socks. Since these are top-down socks, you’ll cast on your Sock Number of stitches (I hope you remember it from Wednesday). I cast on 60 stitches, because that was my sock number. Divide your stitches evenly among four of your needles (15 stitches on each needles, in my case). Then…. knit the leg of your sock. For my basic basic socks, I like to do 1 inch of k1p1 ribbing, then stockinet stitch (all knits, since we’re working this sock in the round) until the leg measures about 6 inches. BUT, you can do anything you like. Think about this sock leg as a canvas for you to play on. The rest of the sock is pretty standard, but you can add all sorts of fun stuff to the leg, if you like. Take a look through pattern books and at pictures of socks and find something you like. 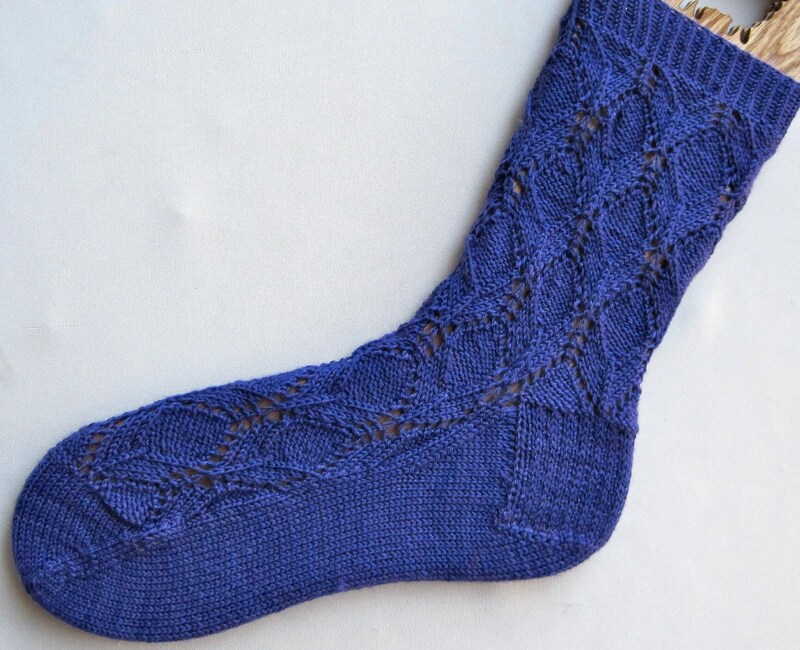 As long as the pattern you choose (ribbing, lace, colorwork etc) uses a number of stitches that divides nicely into your Sock Number, you are free to do whatever you like. So, work on your leg over the weekend, and we’ll move on to the heel flap on Monday. This entry was posted in Knitalong and tagged how-to, knitalong, Leg, recipe, sock, sock number, top-down, tutorial on May 10, 2013 by onemilljellybeans.